Cobblers chairman Kelvin Thomas has conceded the club’s current run of poor results ‘is not good enough’. Thomas says nobody is ‘hiding away from that’ fact, but has also called for there to be a show of unity from everybody at the club to drag themselves out of the mess they are in and ‘fix it’. The chairman, who celebrated his 45th birthday on Monday, also made it clear he is fully behind manager Jimmy Floyd Hasselbaink and his staff, and he feels ‘the players will be taking a look at themselves too’. Thomas confirmed that the club will be busy in the January transfer window, with Hasselbaink being allowed to start putting his stamp on the Sixfields squad. But he also made it clear the manager and players cannot afford to just wait for the transfer window as if it is going to provide a magic formula and make everything right, they need to start getting results now - hopefully beginning with this weekend’s home date with Walsall. Town have not won a game since they turned over Oxford United way back on November 11, and on Saturday the team was humbled 5-1 at fellow strugglers Oldham Athletic. It was their fifth defeat in a run of six matches without a win, with the only plus to another depressing day being the fact that Sam Foley did at least call a halt to the team’s run of more than 500 minutes without a goal with his second-half consolation. 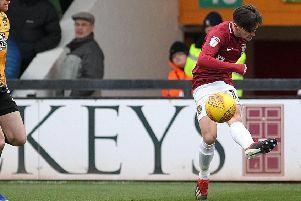 Despite heavy summer investment on players and a first-team squad that is 29-strong, the Cobblers have won just five matches this season in 28 matches in all competitions, and have won only three times in the past 20 games. They are second bottom in Sky Bet League One, two points ahead of rock-bottom Bury who now have a game in hand, but they are also only one point behind fifth-from-bottom AFC Wimbledon, while Doncaster Rovers in 18th are only four points clear of Town. So with the halfway point of the campaign approaching, the Cobblers are not cut adrift, but Thomas is expecting things to improve dramatically. And he believes that improvement will only be achieved with everybody sticking together. “We are still not even halfway through the season, and you have to look at it in its entireity, but the last six or seven games, the performances and results have not been good enough,” said Thomas. And he added: “In reality, it is hard for Jimmy to take over a squad that he has not put together. “I think we were light in a couple of areas, and then the injuries have increased that. “If we had our wider players available and fit, I think we look a bit of a different proposition, but we haven’t had that the past few games and I think it shows. “We need to be stronger in some of those areas, and hopefully we can address that in January, but the key is we can’t just rely on January and think that is going to change our fortunes. “We have got to make sure we do something with the squad we’ve got, and I think everybody has seen what the squad is capable of. “When Jimmy first came in, they looked good. “We then lose a couple of players through injury, but then get a few key people back who are important to the squad and we got on a good run. “You know, post Oxford, people were talking to me about the play-offs, and we didn’t look that far away from it. A total of 15 players were signed by then boss Justin Edinburgh in the summer, and individually they all possess quality and pedigree. But as a team unit they have failed to function well enough, often enough, and Thomas says the players have to offer more. “We have to show faith in the squad, but I think the players do have to look at themselves, and I think they are doing that,” said the Town chairman. “You talk to the players and they are hurting, and we all know what it’s like. “We have all been in environments where things aren’t going so well, and what happens is everybody questions everything. “Everything is always wrong at a football club when you lose games, from the tea, to the players, to the effort, to the intensity, and I don’t think you can criticise the effort or the intention. “We can be disappointed with performances, and the players are the ones that have now got to put it right. There was an immediate reaction when Hasselbaink took over from the sacked Edinburgh at the beginning of September, with the team winning his first two games in charge, but it has been a struggle since. There was a purple patch in October and early November as the team pieced together a six-match unbeaten run, a few days after a horrible 6-0 home defeat to Bristol Rovers, and it seemed the corner had been turned. But it’s all gone a little sour again, although Thomas believes Hasselbaink deserves support and backing as he tries to turn the season around with a group of players he didn’t sign. “It’s always difficult, and Jimmy has to get the balance right of protecting the players, but also being up front about things, and I think he does that well,” said the Town chairman. “He is very focused on getting it right, and they are working incredibly hard. “It is difficult to take over a squad of players you didn’t put together, and we understand and appreciate that, and will show patience on that. Hasselbaink is obviously keen to get some players in he wants, so the team can play the way he wants it to, but there are still four Sky Bet League One matches to be played in December. And Thomas knows the team as it is has to start getting results, and of they can do that then the players’ fragile confidence may be boosted. “Every manager has different ideas, and I had a long conversation with Jimmy on Sunday and we spoke about not just focusing on January, but focusing on the here and now,” said the chairman. “We have two very difficult home fixtures coming up before Christmas, and we hopefully will go into the Christmas period with some points in the bag. “At the moment we want to go into these games and to be confident, but the confidence isn’t that high. “That said, we know how quickly things can change in football and a couple of goals will change that confidence. “It’s easy to say we will put these performances behind us, but we took a bit of a tanking from Bristol Rovers and we saw a reaction to that.